Some people seem to panic a bit at the thought of making a Christmas lunch or dinner. Often the biggest worry seems to be about getting everything ready all at the same time. You can make life easier for yourself by doing a lot in advance of the day. Some things, of course, have to be done at the last minute but even then you can still do a lot of preparation in advance. Let’s go through some of the classic components of a typical Christmas dinner and see what you can do ahead of the game. If you’re having soup (erk, that’s gonna make it quite a filling meal), most soups can be made, frozen and then defrosted and reheated on the day – or even just made the day before and reheated, if you have the fridge space to store it overnight. Personally, I wouldn’t bother with soup at all but would have something much lighter instead, such as a paté. Here are my ideas for simple starters, some of which can be made ahead and frozen. Unless you’re having a big party, a whole turkey is likely to be too large. You could try a turkey breast crown instead. This can also be prepared the day before and popped into the oven on the day so you can present freshly roasted turkey to the table. Alternatively, just use a capon or a chicken instead. There’s no law to say that you have to have turkey (or a substitute). We’ve quite often had roast pork instead because we prefer the meat. These simply must be freshly made. However, there’s nothing stopping you getting ahead of the game by doing advance preparation. You definitely want to peel the spuds and cut them, if necessary, the day before. Keep them in a pan of cold water overnight so they don’t discolour. You can also parboil them ahead of time, which means they’ll be quicker to roast on the day. Again, these can be made ahead and frozen and re-heated on the day, or at least prepared the day before and popped in the oven. Cook’s tip: there’s going to be a lot of demand for oven space and you should give your roast meat and roast potatoes priority, so if you can cut down on the demand for oven time required by the accompaniments, then so much the better. Here’s my easy recipe for pigs in blankets. I never bother stuffing a turkey or chicken. It’s too much faff. It’s just as nice to make stuffing balls and it’s easier. Again, they can be made ahead of time and simply reheated. With all the other things going on, it seems daft to go overboard with veggies. We usually just stick to Brussels sprouts and carrots, both of which can be prepped the day before. If you want to make your carrots look a bit more festive than usual, then julienne cut them and tie them with an edible green ribbon such as you can make easily from spring onion stalks. Here’s how to make festive-looking carrots. As for sprouts, just prep them the day before and boil them on the day. It’s traditional in Britain to boil them to death, but much nicer if they still have a bit of crunch in them. Just buy a jar of cranberry sauce. We rarely bother with bread sauce so there’s no recipe here on Not Delia. Jamie Oliver has a nice one with plenty of photos showing you how to do it. You could save yourself time on the day by doing a bit of prep ahead, such as making the clove and onion infused milk. For some reason I don’t seem to have a recipe for gravy on here either. The gravy just seems to materialise without me thinking about it. However, if you want a nice gravy recipe, here’s another of Jamie’s recipes. Alternatively you could just use some Marmite dissolved in hot water and thicken it a bit with cornflour. With all the other things going on, no one will ever notice, and even if they do it’s unlikely they’ll be bothered. Now, if even the above all seems like too much faff, but you’d miss the turkey and stuffing if it wasn’t there, there’s an alternative to make things easier on the day. Serve a cold buffet. Yes, I know it might sound like a strange idea, but think about how many people enjoy food such as turkey sandwiches or pork and stuffing sandwiches. Offer a selection of cold sliced meat, such as turkey, roast pork or chicken, ham and anything else you fancy. Add some things to go with it, such as sliced stuffing, cold sausages (or even pigs in blankets if you can be bothered), and serve some fancy sauces on the side such as cranberry, or Cumberland. And serve it all up with a plentiful supply of different sliced breads. You can make this as simple or fancy as you please. For example, you might also offer brown bread, slices of smoked salmon, capers and horseradish sauce. You could offer a paté or a selection of them. It’s your buffet – you can choose. Can anyone really be bothered eating a pud after a full Christmas meal? Well, if it’s really necessary to have one, then most good supermarkets offer excellent Christmas puddings, and the even better news is that most of them only require a few minutes in the microwave. Serve with some pouring cream. It couldn’t be easier. 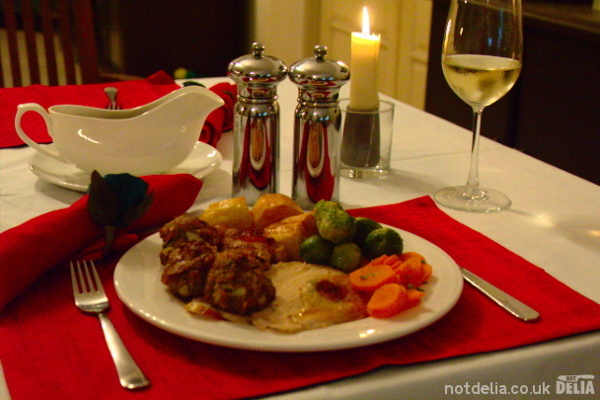 So, for those who want a traditional or almost traditional Christmas dinner or lunch without the stress, there are some suggestions for you. Enjoy your day! Thanks for your comment. Yeah, I agree – Bisto gravy granules are a great cheat sometimes. Of course it’s also nice to do things ‘properly’, but when you have 100 other things to do at the same time, a quick cheat like that can be a big help. I hope you have a lovely Christmas too and that it’s all you wish for.